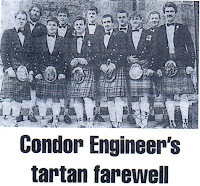 During the short leave, Mac MacCord married in Arbroath, all were wearing kilts. To name a few: Sam Cloud, Kid Currie, Dixie Dean, Tex Dallas, Dave Trotter, Simon Hand and Paul Rogan. G1098 Stores were returned from Norway, direct to Plymouth, whilst those at Arbroath were packed and transported down. The Troop was given a short leave. The Troop moved down to Plymouth , becoming 3 Troop - end April 1987.